Year after year, Elvis Presley fans flock to his Memphis grave to mark the anniversary of the singer's death. In 2010, Forbes magazine estimated his estate's annual income at $60 million. (CNN) -- Their candles flickering in the warm Tennessee night, fans quietly stood vigil over Elvis Presley's grave early Tuesday to mark the 34th anniversary of the singer's death. "Thank you so much for being here and continuing to honor the legacy of my father," said a message from Lisa Marie Presley that was read to fans at the gates of Graceland. "Your ongoing love and support mean very much to me and my family." Presley died at the Memphis, Tennessee, mansion on August 16, 1977, and is buried on the grounds. 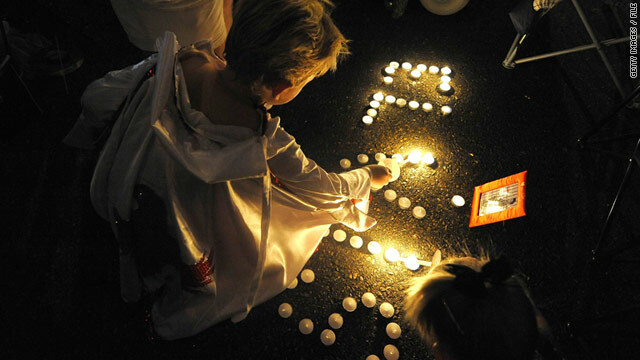 Fans began filing past his grave bearing candles Monday night. Graceland hosts a week of events leading up to the annual commemoration, featuring tribute concerts, appearances by contemporaries and onetime sidemen and fan parties. The "King of Rock n' Roll" was 42 when he was found dead in his bathroom at the mansion, which he bought after hitting it big 20 years earlier. While his death was ruled the result of an irregular heartbeat, the autopsy report was sealed amid accusations that abuse of prescription drugs caused the problem. More than three decades later, he remains one of the top-selling acts in music. In 2010, Forbes magazine estimated his estate's annual take from music sales, a Las Vegas show, Graceland visits and licensing at $60 million.